Demonstrators rallied outside the Media and Public Affairs building Thursday to protest an appearance by Education Secretary Betsy DeVos. 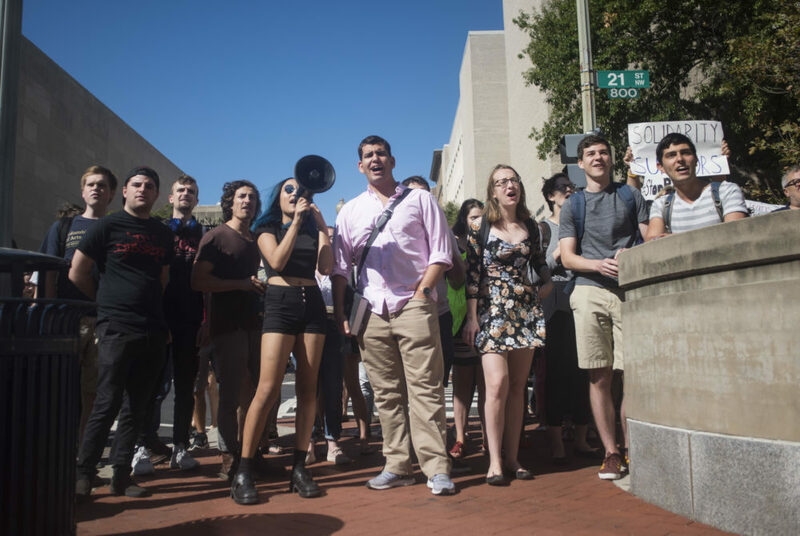 About 40 students and community members gathered outside the Media and Public Affairs building Thursday morning to protest Education Secretary Betsy DeVos’ appearance at a State Department event. DeVos’ presence at a U.S.-China cultural dialogue in the Jack Morton Auditorium ignited outrage among student and community advocates for sexual assault survivors who said they felt targeted by DeVos’ recent actions on Title IX enforcement. Alexa Grasfield, co-president of SASA, said students scrambled within the last day to coordinate the rally and voice their opposition to DeVos’ move to roll back Obama-era directives on sexual assault enforcement. Senior Danielle Ciaurro protests DeVos' appearance at a State Department event. 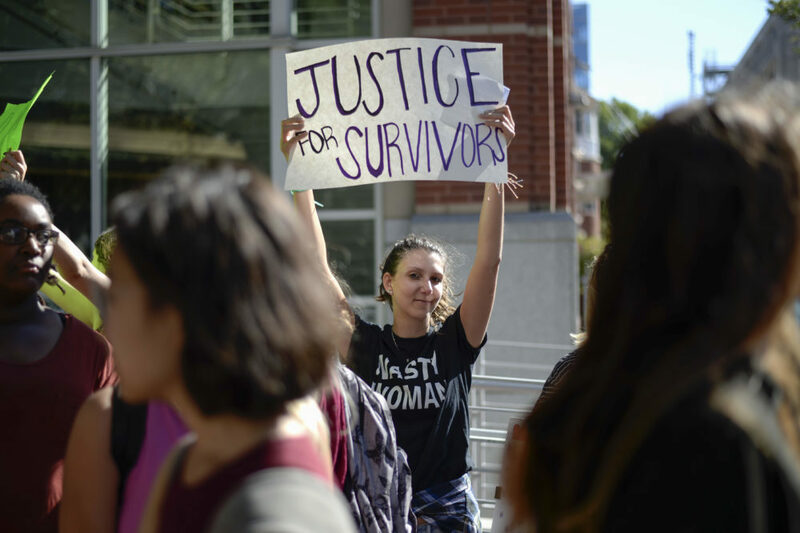 Bailey Bystry, vice president of SASA, said the demonstration showed support for sexual assault survivors and transgender students and would hopefully educate the Foggy Bottom community about efforts to advocate for and protect survivors. 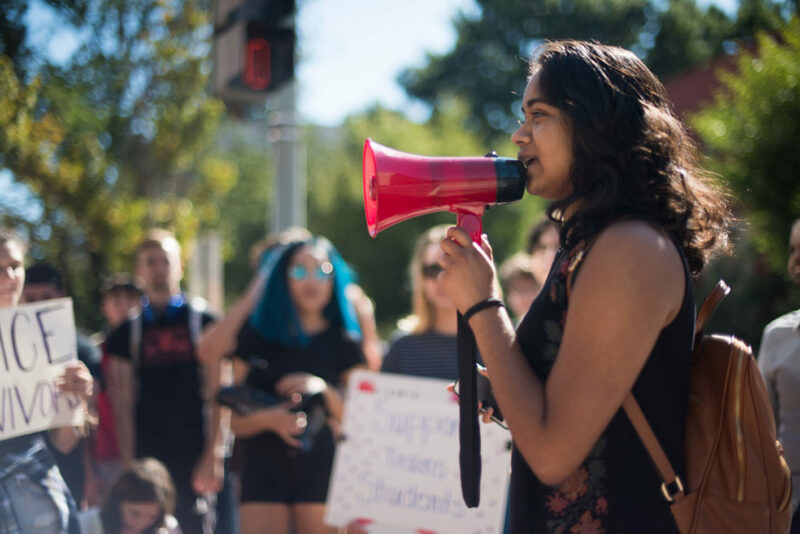 A handful of students spoke before the rally, including Aniqa Raihan, an alumna and sexual assault survivor who led a slew of petitions and protests last semester after she found the outcome of her sexual assault case to be unfair. Raihan said she joined the rally to show support for Title IX and tell DeVos that she doesn’t represent her community. “She doesn’t speak for us,” Raihan said. Addressing the crowd, Raihan said during her case process, she fully realized the importance of Title IX and said the Trump administration is falling short in its support for survivors. Alumna and sexual assault survivor Aniqa Raihan addresses demonstrators at Thursday's rally. Keiko Tsuboi, the chapter leader of Young Progressives Demanding Action, said she helped work on various aspects of the protest, including making flyers and gathering student support. “I’m gay and so the stuff that Betsy DeVos is trying to advocate now with her agenda against trans students and gay students, I’m here to fight against it,” Labas said.